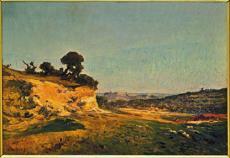 The study of light and its influence on colour preoccupied the artist on a practical as well as theoretical basis. In his landscapes, as well as in his Portrait of a Boy in a Sailor Suit, he was able to apply his observations. He placed his sitter in natural daylight in an outdoor setting. Note his rendering of the boy’s figure: his face, at a slight angle, is bathed in sunlight, which comes from the left and back, fragmenting into lit, half-lit and shaded sections, conveyed by visible brushstrokes meticulously placed so as to enhance the effect. The artist did not seek to describe; the emphasis, rather, is on the expressive potential of colour. 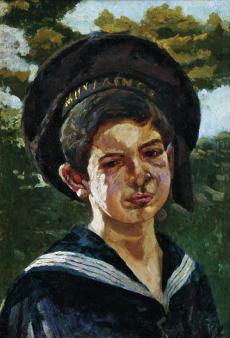 The Portrait of a Boy in a Sailor Suit can be dated to the 20th century, when Savvidis’ plein air painting took on expressionistic qualities. After he graduated from the School of Halki in Istanbul, he attended, from 1878, the School of Architecture of the University of Athens. 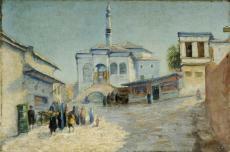 From1880, he studied at the Munich Academy, with financial support from Stefanos Zafeiropoulos. He remained in Bavaria until 1925, developinga very active exhibition agenda, with participation at the Glaspalast, while also travelling to Istanbul, Asia Minor and Athens. He alsoparticipated in international events in Germany and other countries and in 1895 was awarded a silver medal in London. In 1931 the LyceumClub of Greek Women organised a major retrospective of his work. In addition to his other interests, he studied colour, arriving at his own theory regarding colour interaction. Scenes of everyday life, landscapes,still-life paintings, portraits and images inspired by the East comprise his repertory as a painter.